Westies were first recognized by the AKC in 1908. If you are looking for a low-shedding, sturdy little dog, a Westie might be a good choice for you. West Highland terriers, usually called Westies, are generally low maintenance dogs that are friendly and easy-to-train. Not to mention, they are adorable and make easy, on-the-go travel companions. Westies shed very little. If a breeder tells you their Westies are “hypoallergenic,” that is incorrect. Although Westies do make a great choice for those with pet allergies and asthma because of their low dander and lack of heavy shedding. 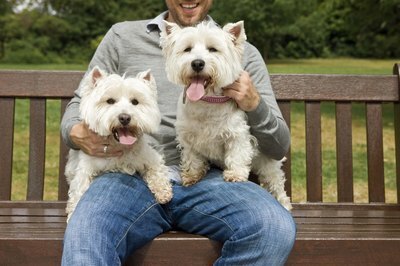 Westies have a double coat: the rough, straight, outer coat and a much softer but denser undercoat. Because they do not shed much, cleaning fur off your furniture, clothes and around the house should be minimal. Though Westies don’t shed much, they still require frequent brushing. Brushing your Westie will help remove dead fur and keep his coat clean and mat-free. A typical outer coat is about 2 inches long and requires routine grooming, including clipping about every four months and stripping a couple times a year. If you brush several times a week with a bristle brush, your Westie will remain clean and only need a bath infrequently. Breed standard dictates his face and head should be groomed in a rounded fashion. If you prefer to take on the grooming duties of your Westie on yourself, you will need the right tools. Review grooming photos and AKC standards for suggested styles. During change of weather, your Westie may shed more and this may be a good time for a groom. In addition to a comb, purchase a slick brush, thinning shears, nail clippers, and two sets of scissors -- a sharp pair and blunt-ended pair. Westies should not be clipped too short, as this may cause skin problems for your dog. Westies are small dogs, part of the American Kennel Club’s terrier group. They average about 15 to 22 pounds and 10 to 11 inches in height. True terriers, they like to bark, dig and are alert, loyal and spunky. They can live in any type of environment and space but should have at least a daily walk to keep them active. Potential health concerns include hernias, hip problems and skin issues. What are the Causes of Low WBC in Cats? Do West Highland Terriers Have a Tendency to Develop Liver Problems?